"The world's first, last, and ONLY, mechanical handheld pocket calculator. *"
Introducing the classic Curta Calculator poster for all Curta fans. This fabulous poster shows a detailed layout of the inner working of Curt Herzstark's amazing machine. 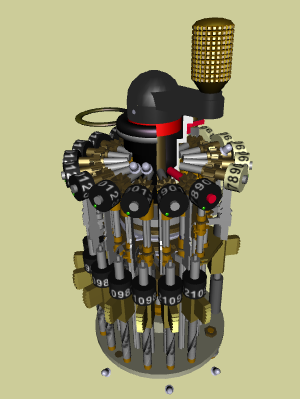 All Curta parts are close to actual size and displayed in multiple exploded views. Every part is labeled with its original name as designated in the Contina A.G. factory service manual. The elaborate and detailed poster design was nearly a year in planning and execution. Original factory photographs, drawings and artwork have been combined with new imagery to produce this engineer's view of a mechanical masterpiece. Many thanks are due to Carl and Jack for their encouragement and enthusiasm. The Curta Calculator poster is very suitable for framing and will make a wonderful gift to any Curta enthusiast. It is an essential element in any Curta collection. The poster measures 24 1/2" (62cm) in width and 16" (41cm) in height and is printed on high quality Strobe Gloss 100# cover paper. The poster will be shipped in a rugged 3" x 18" Kraft Mailing tube. The Curta Calculator poster printed in the German words of the Great Master, Curt Herzstark. Introducing the classic Curta Calculator poster in German. Like the original Curta poster, this fabulous poster shows a detailed layout of the inner working of Curt Herzstark's amazing machine. 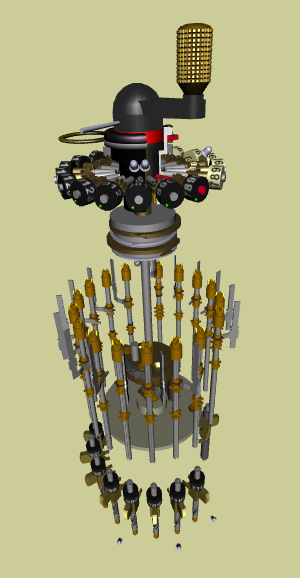 All Curta parts are close to actual size and displayed in multiple exploded views. 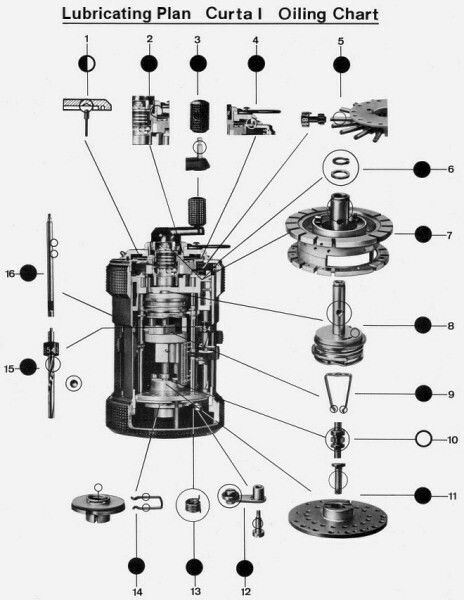 Every part is labeled with its original name as designated in the Contina A.G. factory service manual. The elaborate and detailed poster design was nearly a year in planning and execution. Original factory photographs, drawings and artwork have been combined with new imagery to produce this engineer's view of a mechanical masterpiece. Many thanks are due to Hans-Rudolf Roshard for his help translating this poster to German. The Curta German Calculator poster is very suitable for framing and will make a wonderful gift to any Curta enthusiast. It is an essential element in any Curta collection. 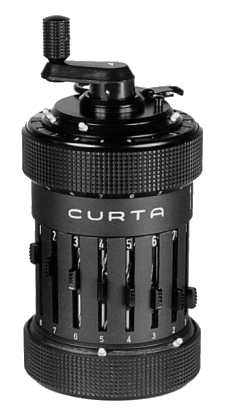 Over 800 CURTA Owners and close to 1,000 Curtas! The CURTA Collectors and Registry Page is a list of people who collect/own/like CURTAs! Production was started at April 1, 1947. In 1966 CONTINA AG was bought by the firm HILTI AG in Schaan. Production was stopped on November 1970. CURTAs were sold until early 1973. 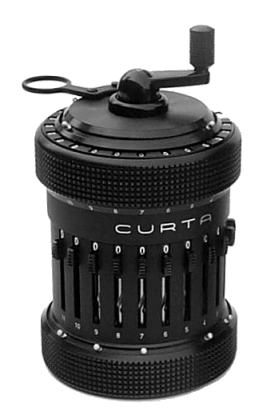 There are +/- 80000 Curta I and +/- 60000 Curta II machines. Curt Herzstark heard 150,000 to 160,000, maybe even more CURTAs were manufactured. Notes: 1- 7178 then a few more pin sliders were produced from 9321-9620.
number on the bottom row of the bottom plate). on the top row of the bottom plate. In 1949, only 300 CURTAs were made each month. By 1952, 1,000 CURTAs were made each month. CUTRA 2s started at serial number 500,000. The black type II case ended between 510348 and 510536.
the calculator was assembled out of spare parts. This page contain pictures of the oldest type I and type II Curtas. If you own a really old (or really new) Curta then send me your pics and I'll add them to this page if they qualify. CURTA Production Date by Serial Number contains a discussion and two formulas to calculate approximately when your CURTA was made. Here's a great article from Daniel F F Ford with a more precise method to determine the Curta's age: When was your Curta made? Above are three different styles of type 1 Curtas. the labeling/lettering, and the storage cans? Curt Herzstark, OH 140. Oral history interview by Erwin Tomash, 10 September 1987, Nendeln, Liechtenstein. Charles Babbage Institute, University of Minnesota, Minneapolis. Herzstark, an Austrian inventor and manufacturer of calculators, describes the development of the Austrian Calculating Machine Manufacturing Company (Rechenmaschinefabrik der Austria Erstanden Compagnie) and his subsequent work in the industry. The company, founded in Vienna by his father, Samuel Herzstark, in 1905, introduced the first electrically-driven calculator based on improved designs of the Thomas Arithmometer. Herzstark describes the disruption of the industry during World War I, his involvement with the company after the war, competition with American companies, and his first invention, a mechanical memory for holding subtotals, which appeared in 1928. Herzstark managed the company in 1930 and began work on his own design for a hand-held calculator. With the Anschluss of 1938, the company was again converted to war production, and produced custom gauges for German tanks. Herzstark, a Jew, was able to avoid arrest until 1943, when he was sent to Buchenwald concentration camp and worked as a technician. He recounts his arrest and internment, and how he completed the design of the CURTA hand-held calculator, a prototype of which was produced in Weimar, Germany, by Rheinmetallwerke at the end of the war. 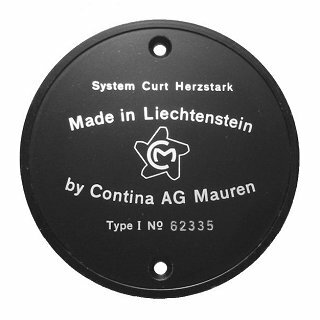 The Prince of Liechtenstein bought the design and the calculator was initially manufactured by the CURTA division of Contina AG of Liechtenstein. It was produced until 1972, when the electronic calculator forced it from the market. The transcript is available in English and German, and can also be downloaded from the CBI web site. Curt Herzstark and his Pocket Calculator CURTA. This artice was translated by Andries de Man -- Thanks Andries! The CURTA Articles page is where you will find interesting articles written about the CURTA. A really good CURTA article from Product Engineering magazine -- October 1952. Olaf Veenstra's Amazing Curta Simulator! 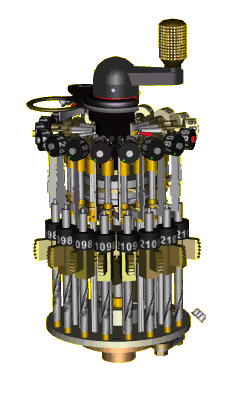 A complete "Mechanical" Curta simulation. Watch every major part of the Curta turn and interface with it's mating piece. 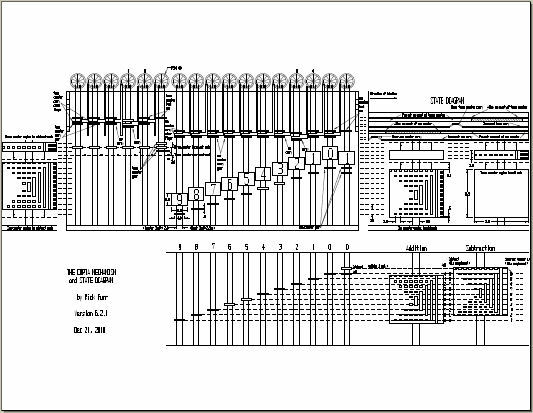 Now you can see the step drum perform it's 10s complement magic, the gears turn, the transmission shafts rotate, the carry levers shift, and the digits count. Spin it, flip it, zoom in, zoom out, explode it. Turn the crank slow, turn the crank fast. Watch it operate in any position or view angle! What would Curt Herzstark have thought! Amazing! This is the new granddaddy of the Curta Simulators and must be tried! Jan Meyer's Fantastic Curta Simulator! A complete Curta simulation, with which all arithmetical examples can be accomplished. You don't have a Curta? Then you can use the Curta simulator . It needs Flash Player 6, which you can download here free of charge. 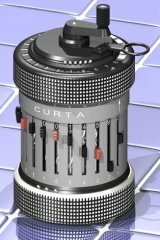 The Curta Calculator simulation is a 3D re-creation of the original portable mechanical calculator, invented by Curt Herzstark. 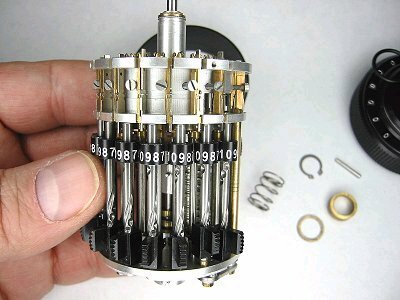 Unlike modern electronic calculators, the Curta was entirely mechanical. It could add, subtract, multiply and divide, and unlike other calculators of the day, it could fit in your pocket. 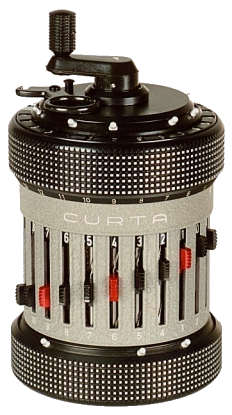 The CURTA Manual is a transcription of the CURTA Manual titled "Your CURTA Calculator" on one side and "The 4 arithmetical rules" on the other. Pictures are now included. The same CURTA Operating Manual rendered simultaneously (CURTA ESP) by Andries de Man. A French CURTA manual created by Philippe DAILLY. A French CURTA manual translated by Andries de Man. A second French CURTA manual translated by Andries de Man. These manuals are from the wonderful Museum Mura. Unfortunately they are in German. Also see the assembly video (in my Video section below). These files are from the wonderful Museum Mura. Also see the assembly video (in my Video section below). I get asked all the time about how to clean and lubricate the Curta. Click on the Lubrication image for some helpful email snipets from Nicholas Bodley and Jack Christensen plus some scans from the Curta Service Manuals. Ever wonder how to work on a Curta? To do it right your need many specialized tools. Here are some of them from the collection of Hans-Rudolf Roshard. 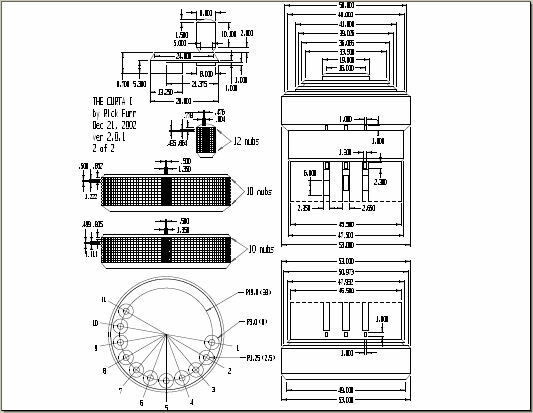 I have discovered a total of 60 CURTA patents! Curt was also assigned at least 19 patents related to various manufacturing processes and devices (sorry, I don't heve these published). And 12 patents by Kurt Herzstark's principal engineer Mr. Elmar Maier. I also have found 37 patents assigned to Curt's father [Samuel Jakob Herzstark] dealing with adaptations, additions and improvements to the Thomas calculator (sorry, I don't heve these published either). Details of these early prototypes can be seen in some of Curt's patents. The Helmut G. Ayen Collection Page is a set of 33 beautiful pictures that I was sent from Helmut Ayen in Hossingen, Germany. He not only owns a pair of type I and type II Curtas but also a pair of type I and type II Demo Curtas! 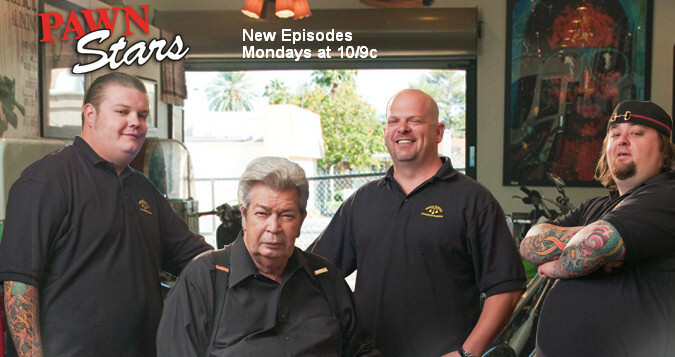 Enjoy the pictures and as always, click on any picture to get a larger version. Here is a great picture created by John Cherry. He was learning to use ray tracing software (POV-Ray 3.02). 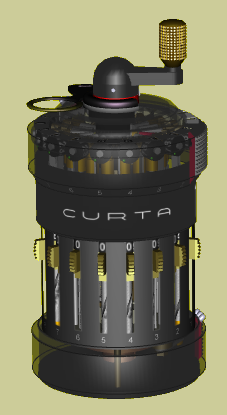 This is a picture of his Curta Type II (number 546692). The picture uses 16 Million colors. There are equivalent versions of POV-Ray for MS-DOS, Windows 95/98 & x86 NT, Macintosh, PowerPC, Amiga, SunOS, Linux (on Intel platforms) and generic Unix. Here is a large selection of special Curtas. Many of the pictures are from the collection of Hans-Rudolf Roshard. The Skeleton Curta belongs to Richard Moor. He worked for Victor Comptometer, in Chicago, in the Research Center, as Prototype Model Maker from 1967-1976. There are 3 cut-out "windows" on the clearing plate, 3 long "windows" on the upper knurled ring, 4 long "windows" on the lower knurled ring, 6 "windows" on the bottom plate, and the middle portion of the unit is open. All of the Lettering, Numbers and Arrows have been left INTACT, and the Little "rechnende Mocca-Mühle" is still fully functional. The picture of a chrome Curta is from Stephan Weiss. According to Reinhold Rehbein, the history says that, a short time before the factory in Lichtenstein was closed, Curtas were made from different spare parts. Almost every old Curta factory machinist has made a variant. The CURTA company produced demo units for their sales force. According to a conversation with a factory trained repair technician, they only produced one demo unit per country that the Curta was sold in. 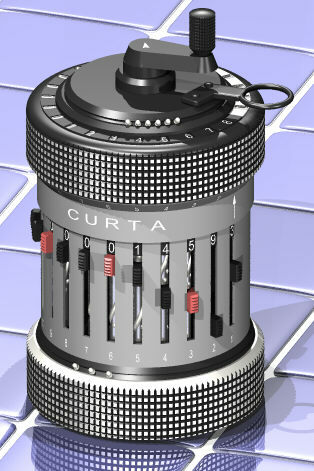 If you own a Demo unit, send me a picture and I'll register it on the Curta Demo page. These pins were made for an annual collectors meeting in Liechtenstein. Thanks to Skip Godfrey for sending these pins to me. This page contains pictures of Curtas that are on display in museums around the world. If you find any new museums/pictures send them to me and I'll add them to this page. CURTA Literature Listing is a list of all know CURTA literature compiled by Rick Furr and Skip Godfrey. Please send us copies of your literature if it is different so we can include it. The CURTA E-Mails page is a set of interesting E-mails distributed by Erez Kaplan's Calculating Machines List server. These CURTA Ads were from Scientific American, June 1961 and June 1971 respectively. Ernie Jorgenson with Office Machine Americana is now offering copies of two CURTA Repair Manuals (These manuals were formerly offered by Skip Godfrey). The two Service Manuals were obtained by Skip Godfrey from Daniel Lewin in Germany. Daniels a law student and met Curt Herzstark shortly before his death; Herzstark gave him the manuals. With Skips and Daniels permission we are offering photo-reprints of these Service Manuals to anyone who wants them. CU1	Service-Handbuch for Curate Rechenmaschine Model II - 11x8x15 (In German) Includes 'Disassembling a Curta Calculator. CU2	Service-Manual for Curta Calculating Machine Model 1 - 8 X 6 X 11) This manual is written in English. Includes Dissassembling a Curta Calculator. 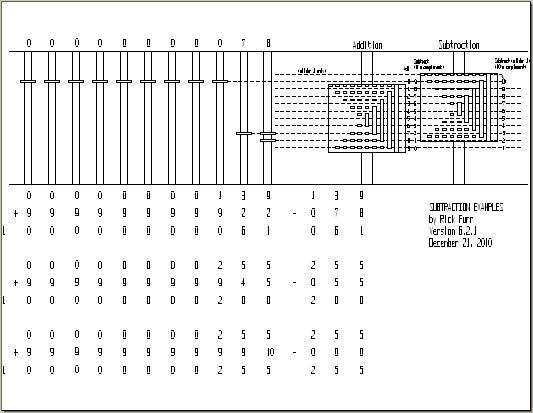 CU5	Computing Example For The "Curta Calculating Machine." CU11	YOUR CURTA CALCULATORS. 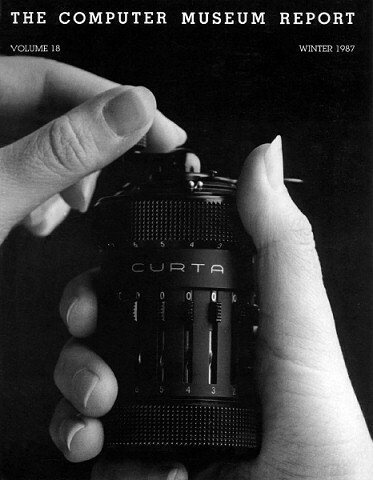 OPERATIONS FOR THE CURTA I AND CURTA II. 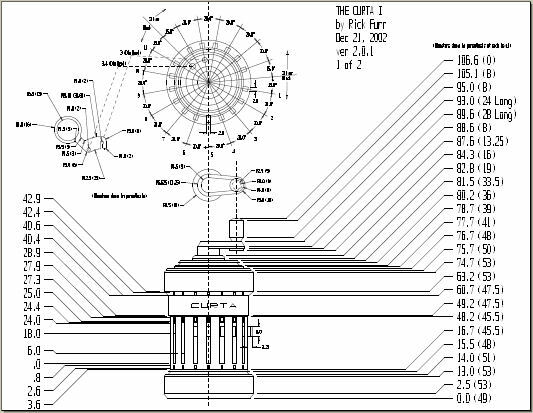 CU12	4 CURTA PATENTS INCLUDING THE ELECTRIC MODEL. "Any questions, please email (Ernie Jorgenson) at rbc(at)cableone.net." This is a great instructional video based on Olaf Veenstra's YACS VRML Simulator! * "The world's first, last, and ONLY, mechanical handheld pocket calculator." credit to Jim Chen, Fair Lawn, NJ!